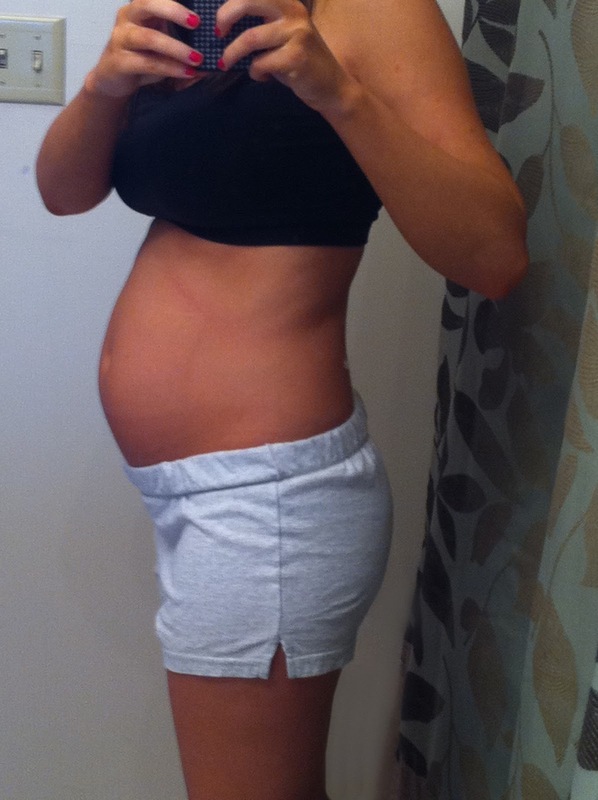 Total weight gain/loss: I think around 8 pounds..going to the doctor on Monday and we will know for sure! EEK! Maternity clothes? I have plenty of shirts, but need to get some more pants! Stretch marks? I don't think stretch marks are going to be the problem here. What is going to be a problem is these little tiny red dots I'm getting on my arms and chest. My Mom said she got them when she was pregnant, but I don't think she got as many as I have, I hope these little boogers go away! Sleep: Oh, well, not so great, but thanks for asking. I have a husband who 1) talks obnoxiously in his sleep. 2) elbows me in the face in his sleep. 3) sleeps in the dead middle of the bed. Then on top of that, we live on the college campus where stupid loud college students scream at the top of their lungs all night long. Then on top of the top, my bladder is the size of a grape and I have a child who is squashing my already small bladder so I wake up to pee every hour. Best moment this week: BEHOLD! There has finally been a memorable "best moment" that is note worthy! I can definitely feel her moving and flipping around. I've been torturing her every day by shining a flash light on my stomach to get her moving. I love it! Movement: Prime time for movement is early in the morning and late at night. On the rare occasion that I do see my husband (which is very very rare) I will try to get him to feel. But honestly his hands are always ice cold, and that ain't happnin' on my tummy. He's gotta warm those suckers up first! Food cravings: Frosties! I mean, my appetite is pretty big these days. The only this I don't crave is steak or chicken. But give me a corn dog and I'm all over it! Labor Signs: No labor signs yet! Belly button in or out? In..but getting bigger! What I miss: The beach. I think I'm having spring break withdrawals. Everyone here is getting ready to go to the beach for SB and frankly, I'm jealous. I think I've told Adam every day for the past week that I want have to get to the beach soon. Until then I will have to settle with my Fake Bake for my tan. What I am looking forward to: Doctors appt on Monday, and we will set up our appt for our 4-D ultrasound while we are there! Weekly Wisdom: Don't watch One Born Every Minute. If you do, only do it to take notes of what you won't do while in labor...for instance: I will not be screaming," THE RING OF FIRE!!! THE RING OF FIRE!!" while pushing my child out. Seriously, if you take anything from this blog, it's to just stay-the-heck-away from any show having to do with child birth. Milestones: I have officially survived half of a pregnancy!! !...which sounds awesome except for the fact that I was unaware of it for the first 5 weeks...oh my hell, I've still got a long way to go. Lord, be with me.